In Broad Daylight DVD (1991) Region 1. Color. Brian Dennehy, Cloris Leachman, Chris Cooper, Marcia Gay Harden, John Anderson. Based on an incredible true story. Murderous fanatic Len Rowan and his family insult and terrorize the citizens of a small town for years. One day a saleswoman's comment about Len's son not being able to pay for his candy once again triggers Rowan's rage. As revenge for the believed insult, the whole family starts stalking the shop owner and her husband...escalating and finally erupting in violence against an old man. Len is arrested but is immediately released on bail. His attorney delays the trial for more than a year—while Rowan keeps threatening the witnesses. Finally, the townspeople reach their breaking point, taking the law into their own hands in a stunning act that echoes to this day. 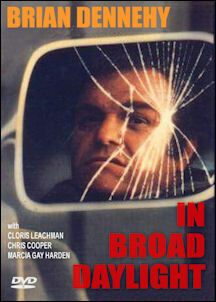 Brian Dennehy gives one of his most riveting performances in this television adaptation with a stellar cast.